Emory's women's swimming and diving team won its sixth consecutive NCAA Division III national championship. The Emory University Department of Athletics finished eighth in the 2014-15 Learfield Sports Directors' Cup Division III standings, as announced by the National Association of Collegiate Directors of Athletics (NACDA). The eighth-place finish represents the 14th time in the past 15 years that Emory has recorded a top-10 showing. Emory registered a final total of 807 points, the fifth-highest mark for the department since the inception of the Cup in 1995-96. 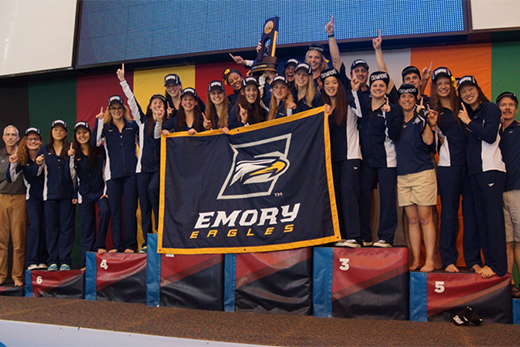 Emory scored Directors' Cup points in 13 sports in 2014-15 and captured a national championship in women's swimming and diving while claiming runner-up berths in volleyball and women's tennis. Other Emory teams to come away with top-10 finishes in the Directors' Cup include men's swimming and diving (fourth), men's tennis (fifth), baseball (fifth), men's basketball (ninth) and softball (ninth). Emory athletics also claimed nine University Athletic Association championships during this past school year: volleyball, men's basketball, women's swimming and diving, men's swimming and diving, men's tennis, women's tennis, men's outdoor track and field, softball, and baseball. Williams College finished in the No. 1 spot with 1,053 points, its 18th Directors' Cup title in 20 years. Johns Hopkins was runner-up with 1,016.75 points. A total of 322 schools accumulated points in the final Division III standings. The Directors' Cup honors institutions maintaining a broad-based athletics program, achieving success in many sports, both men's and women's. Started in 1993-94 for Division I by NACDA and USA Today, it expanded in 1995-96 to include Division II, III and the NAIA and, in 2011-12, expanded to include junior and community colleges. Points are awarded based on each institution's finish in up to 18 sports — nine women's and nine men's.